There is nothing easier. The logic it is not so intuitive, but it is simple. I will show it with an example: imagine dividing a cincle in 7 congruent circle sectors. Which would be the angle in degrees, minutes and seconds? The circunference, or a full angle (entire lap), by definition has 360°. Dividing 360° by seven (see that we are dividing the unit ‘degree’ by an adimensional number, this way, the result will be in degree) we will have: 360°/7 = 51.4286°. This means that the angle of each circular section will have 51 integer degrees and 4256 tenths of thousands of degree (decimal portion). Observe that the decimal portion is a little bit smaller than the half of an angle or half degree (0.4256 < 0.5). The entire part (51º) is subtracted from the result (51.4286°) and will be used as the fraction in degrees of the solution. The decimal part (0.4286°) will be multiplied by sixty, because we know that a degree is composed by sixty minutes (60’/1° (sixty minutes by degree)). Observe that the result of this equation will have the unity in minutes, because the unity ‘degree’ of the dividend and of the divisor will nullify theirselves: 0.4286° * 60’/° = 25.7143′ (observe that this value is a little bit lower than thrity minutes (half of the degree), so going on with this logic, on this moment we will subtract the entire part that is the value in minutes (25′). If the result was showed in degrees and minutes, we should round the result to 26′, because 0.7143 > 0.5 and it would be closer to the correct one. However, let’s continue with the calculations to find the value of the seconds. We know that one minute is the same of sixty seconds (sixty seconds for each minute or 60″/1’or 60/’). This way, the decimal part of the result in minutes should be multiplied by 60 and rounded to find out the seconds (0.7143′ * 60″/’ = 42.8571″ or 43″ rounded). After this all arithmetic, we reach the conclusion that the angle 51.4286° can be expressed by its approximate value in degree, minute and second of 51°25’43” (fifty and one degrees, twenty and five minutes and forty and three seconds). Let’s check the results? 43″ x 7 = 301″, that divided by 60 will have as a result 5 minutes plus 1 second (301″/60″/’ = 5′ + 1″). 25′ x 7 = 175′. We will sum the minutes obtained from the multiplication of the seconds (175′ + 5′ = 180′) one hundred and eighty minutes divided by 60’/° = 3°. Going on, 51° * 7 = 357° that added up with the 3° derived of the sum of the minutes and seconds = 360°! And that second that it was held above… where did it come from? Remember that the value was rounded from 42.8571″ to 43″, and this difference (0.1426″) when multiplied by seven produces the deviation of one second. 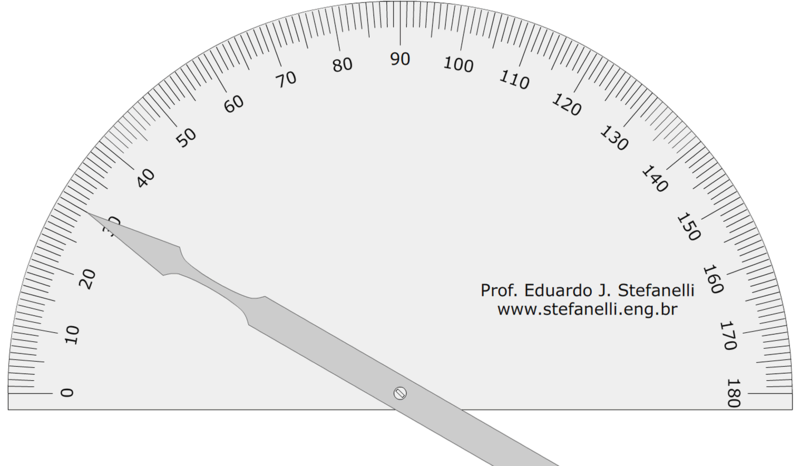 That’s it, interact with the virtual goniometer in decimal degree and later take a look in the goniometer with vernier in degree and minute . This thing will be more clear at all.